New film explores the forgotten era when the Caribbean island became a temporary gem hub after opening its doors to thousands of European Jews fleeing the Nazis. After a wave of Jewish refugees to Cuba in the 1920â€™s and 30â€™s, the island shut its doors to immigrants, most notably to the Jews aboard the ship the St. Louis in 1939. In 1940, Cuba changed course and took in 6,000 Jewish refugees, including hundreds of Jewish diamond cutters and their families who, for a few years, turned the small tropical island into one of the worldâ€™s major diamond-polishing centers. In the factories, women work beside men, Jews beside Cubans. The film was born of the tales that Marion Kreith told her daughter Cuba’s Forgotten Jewels co-director Judy Kreith about her escape from Nazi-occupied Belgium and her teenage years in 1940s Havana. Marion and other refugees interviewed in the film recall their lives in wartime Havana: the draw of Cuban food, music and dance, its language and people, and also the challenges they faced in this unfamiliar land. Features an original soundtrack of Cuban and Jewish music. Judy Kreith is a professional dance educator and choreographer. She received her MA from Stanford University. Her mother, Marion Finkels Kreith, is the key inspiration for this film. 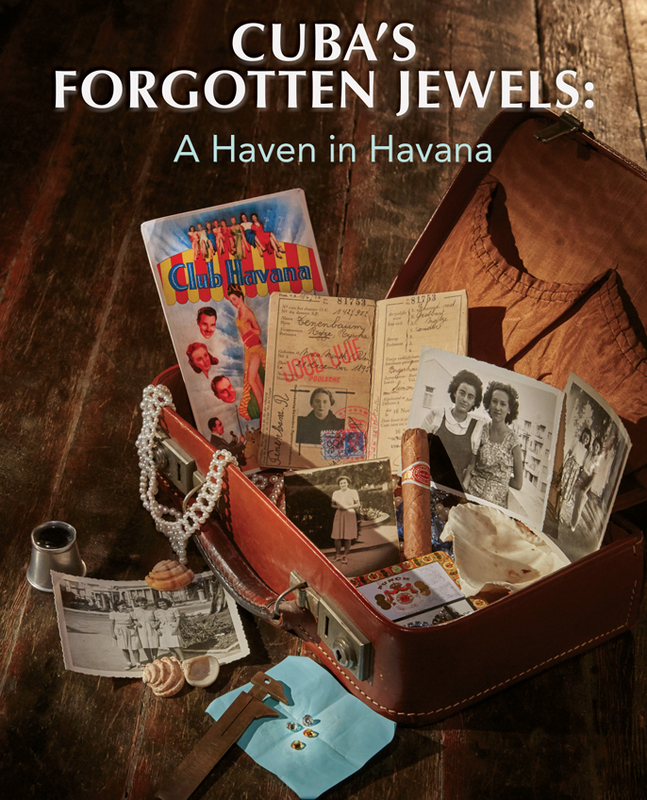 Judyâ€™s study of Cuban dance brought her to Cuba where she began researching and working with local historians to document the history of Jews in Cuba and most particularly the experience of Jewish refugees and the diamond polishing industry that flourished in Havana during WWII. Judy lectured widely on the topic of Jewish refugees to Cuba, including most recently at a conference at the University of Antwerp, Belgium. Robin TruesdaleÂ is an award-winning documentary filmmaker and the founder of Two Hands Films. Her film A Beautiful Equation: Einstein, Bohr and Grandmothers won Best International Film at the Sunrise Film Festival and the Platinum Remi Award at Houston Worldfest. Her earlier film Conviction won the Must See Award Telluride at Mountainfilm and the Peopleâ€™s Choice at the Frozen River Film Festival. Robin, who has an MS in journalism from the University of Colorodo, began her career as a news editor for a Denver television station. Her work deals primarily with social justice, cultural, and humanitarian issues. Vince ChericoÂ is a four-time Grammy Award winner and accomplished drummer who has toured with Arturo Oâ€™Farrill & The Afro Latin Jazz Orchestra, Dee Dee Bridgewater, Gato Barbieri, Paquito Dâ€™Rivera, and Ray Barretto. Vince, who has toured extensively in Cuba, studied Afro-Cuban music and drumming with Roberto Borrell, â€œLittleâ€� Ray Romero, and Joe Santiago. Kip Kuepper, who composed the original score for Cubaâ€™s Forgotten Jewels, is a Grammy-nominated musician and founding partner of Coupe Studios Music. He is a composer and sound designer for film and television. Bound for Nowhere: The St. Louis Episode (USA, 1939, 9 minutes, B&W) documents one of the Jewish community’s efforts to save Jews fleeing Nazi Germany and records the indifference on the part of many nations—including the US—to their plight. The Joint Distribution Committee (JDC) produced this film in 1939 to record what it thought would be a successful effort to save over 900 Jews, including 200 children, by sailing them from Nazi Germany to Cuba on the ship, theSt. Louis. When Cuba refused to allow the passengers to land, the ship sailed to the Miami area where the US government also barred the refugees’ entrance. The St. Louis languished in the waters around Cuba while the JDC searched for countries to accept the refugees. Finally, some European countries accepted them and the St. Louis returned to Europe. Tragically, many of these refugees ended up in countries subsequently occupied by Germany and ultimately lost their lives in the Holocaust.